Please tell me that someone else can relate to this: In high school you think you’re pretty hip (okay, the fact that I just used the word “hip” pretty much tells you that I was anything but cool in high school) because you know about all the coolest lingo, the latest in celebrity gossip and where to buy the most AH-mazing clothes. Fast forward what seems like only a few years and you’re in your mid-thirties, not caring if your hair is done before going to the grocery store and when you hear teenagers talk it’s like listening to a foreign language. Can you relate? Phew! Glad to know I’m not the only one! 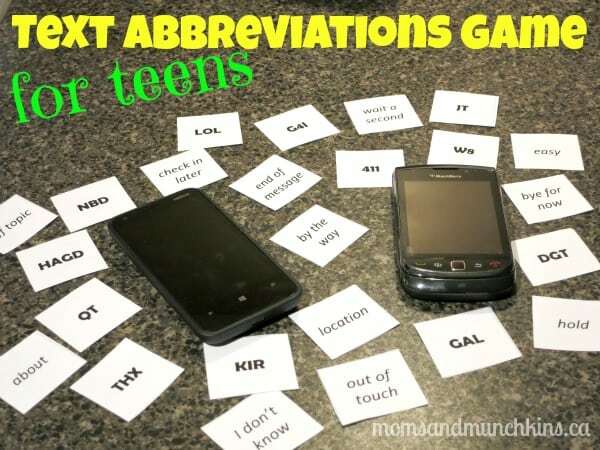 If you’re looking for a fun game to play with your teens, I have the perfect game for you…Text Abbreviations Game! I’ll warn you now though, your teens will likely win this game. Playing the game is simple! Print the free text abbreviations game flashcards. Each sheet has two sides so make sure you print them together (page 1 is the front and page 2 is the back then page 3 is the front and page 4 is the back, etc.) so the term page is on the front and the answer page is on the back of the sheet. Then cut out the cards along the dotted lines. I’ve also left a few blank cards for your teens to write down some abbreviation questions and answers to try to trick you. Simply hold the large bolded side towards the other player(s) with the italicized answer side facing you. See how many answers the players can get right within 10 seconds. Why only 10 seconds per round? The short time frame may get the players a bit flustered and that’s when the funny answers start coming out! Text Abbreviations Game – Practice Round! Okay, let’s see how hip you really are. Here are a few text abbreviations – do you know what they stand for? You’ll have to look at the free printable game for the answers. In the comment section below, let me know how good (or bad) you did! For more text abbreviations, simply type “text abbreviations” into a Google search bar. There are plenty of different sites for you to do some research. For more free games plus activity ideas for teens, follow us on Facebook, Twitter, Pinterest and Bloglovin’. You’ve saved my life! Thank you! For the rainy days, this is going to be an engaging activity! Thank you for stopping by! I hope you have fun with the game.